I don’t really know how pad Thai became the most famous of Thai foods in America. To me, it is but one of many quick fast foods, with the best served by noodle carts, inexpensive sidewalk eateries, and small, nondescript mom-and-pop noodle shops, rather than fine restaurants, in the cities and towns of Thailand. I always find it amusing when restaurant reviewers judge the quality of a Thai restaurant by the quality of its pad Thai, as noodles can hardly take claim as lying at the heart of my country’s cuisine. In fact, its name literally means “Thai-style stir-fried noodles,” and for a dish to be so named in its own country clearly suggests an origin that isn’t Thai. Indeed, noodle cookery in most Southeast Asian countries was introduced by the wave of immigrants from southern China settling in the region the past century. They brought with them rice noodles and their ways of cooking them. During the recession following World War II, the post-war government of Field Marshall Pibul, desperate in its efforts to revive the Thai economy, looked for ways to stem the massive tide of unemployment. Among the occupations the government aggressively promoted to give the populace a way to earn a living was the production of rice noodles and the operation of noodle shops. Detailed instructions on how to make the noodles and recipes were printed and distributed all around the country. From these efforts, rice noodles became firmly rooted in the country and have since become a widespread staple food. The ethnic Chinese had good business sense, survival skills and entrepreneurial spirit. 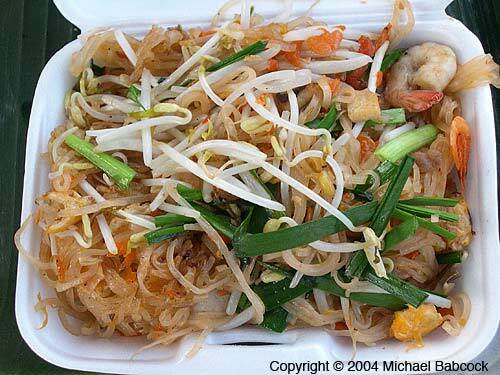 Seeing how the Thai people were very fond of the combination of hot, sour, sweet and salty flavors, they added these to their stir-fried noodle dishes and gave it a fusion name, much like Western chefs today are naming their dishes Thai this or Thai that on their East-West menus. Back home, there are as many ways to make pad Thai as there are cooks, geographical regions, moods, and creative entrepreneurial spirit. The pad Thai recipe I teach in class is a basic traditional pad Thai recipe (if “traditional” is a word that can be applied to a fusion dish invented in relatively modern times), combining the hot, sour, sweet and salty flavors so characteristic of Thai cuisine. Variations can be made by changing the sources of these four flavors and adding personal touches to make each combination unique. Many American Thai restaurants use tomato ketchup, yielding reddish noodles coated with a thick gooey sauce, which has a flavor and color appealing to the American palate. Other restaurants use Sriracha bottled chilli sauce instead of ground dried chillies, resulting also in reddish noodles. My recipe yields noodles that are firm and chewy with the strands dry and separate (the way I like it), but if you prefer the soft and mushy texture of some restaurant noodles, precook the noodles in boiling water before stir-frying. If you are one of those people in search of the ultimate pad Thai, surf the Web for a site dedicated solely to this noodle dish of humble, mixed origins, reportedly boasting a collection of over fifty recipes. After trying them out, you might just decide it’s time to move beyond pad Thai to other fabulous noodle dishes Southeast Asia has to offer. 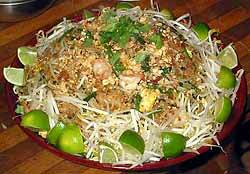 Here’s a link to Kasma’s Pad Thai Recipe. One of our first blog posts was Pad Thai at Aw Taw Kaw Market. Written by Kasma Loha-unchit, November 2009. 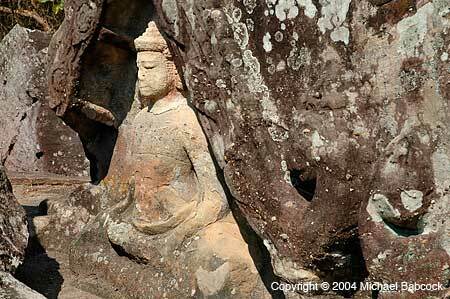 Thailand is, of course, a predominantly Buddhist Country; estimates say 90% or higher of the people are Buddhists. This lovely Buddha image is found at Phu Phrabat Historical Park in Udon Thani Province in northeastern Thailand (Isahn). The aging of the stone is a lovely reminder that everything which is created also eventually passes away. Now while this discourse was being delivered the spotless, immaculate vision of the Dhamma arose in the venerable Kondanna thus: All that is subject to arising is subject to cessation. Kondanna had his realization after the Buddha’s first teaching (“Setting Rolling the Wheel of the Dhamma”) to the 5 ascetics that he had been part of before he went his own way to find enlightenment. This quote is in the Mahavagga 1:6 in the Vinaya Pitaka of the Buddhist Pali canon. I found it on page 44 of The Life of the Buddha by Bhikku Nanamol, published by the Buddhist Publication Society, 2001 edition. Thailand is a tropical country and one of the pleasures this affords is to see beautiful plants that we normally don’t get to see in the San Francisco Bay Area. Kasma took this picture of a torch ginger flower at a resort where we stay in Kuraburi during her trip to Southern Thailand. 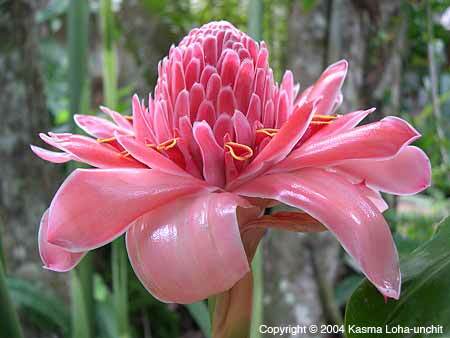 The resort has a cutting garden in back; Kasma always spends some time there taking photographs of the lovely flowers. One of the things I like to do is to collect recipes that I think of as “faux Thai.” They are called Thai but when I read them, it is unclear what it is that actually makes them Thai. In my opinion, they should not be labelled as Thai. Here are my credentials: I’ve known Kasma since 1991 and we’ve been married since 1994. In that time I’ve taken many of her Thai cooking classes, shared countless Thai meals with her both in this country and in Thailand, where I’ve gone on 14 different occasions. I’ve had the great benefit of living and eating with a master Thai chef with a gift for teaching. It is unavoidable to realize that food is an important part of Thai culture. In some ways, Thailand is like an open-air food market; there seems to be food everywhere. Their cuisine is complex involves many different ingredients, many of which are shared in common with other Southeast Asian cuisines. When I think of Thai food I think of the burst of flavors that explode in my mouth when I eat a good Thai meal: all of the various flavor groups are stimulated and the taste buds light up in the mouth. If I had to characterize Thai food in a few words I probably use flavorful, complex, bright, fresh. In a faux Thai recipe, there often is the addition of one or two ingredients that are also used in Thai cooking. Never mind that nearly any ingredient found in Thai cuisine is found in other Southeast Asian cuisines as well! Unfortunately, the most popular “Thai ingredient” in the minds of many people seems to be peanuts. Peanuts originally come from the Americas, from Brazil. They travelled to Africa, then to North America and then to the rest of the world. Peanut sauce originated in Indonesia. They are not used very often in Thai food. Now I’m not against fusion food. After all, Thai is pretty much the ultimate fusion food: they’ve incorporated so many ingredients into their cuisine while not losing their own flavors. One example would be the spicy, hot red chillies that so many associate with Thai cuisine; they were introduced by the Portuguese. The Thai’s, however, didn’t then go call a dish “Portuguese” because they added red chillies – they incorporated them into their own cuisine. A good chef should also know, too, that ingredients by themselves do not make a cuisine. It is the way of cooking that produces the unique flavor combinations that characterize the cuisine, be it French or Italian, Indian or Thai. 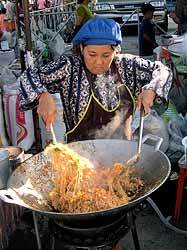 Thai cuisine is a unique style of cooking that makes use of a wide range of ingredients, combining them in a way that produces flavor harmonies. A lot of these things are wildly conflicting and contrasting, chaotic flavors, these sharp, pungent flavors, and the Thai creativity is how to pull them together and create flavor harmonies that reflect the taste preferences of the people of our country, the people of Thailand. That’s what makes the food Thai. I think that we should remember that the word Thai is the name of a people, and a very proud people. Personally, I think that we should be very careful about what we label as Thai and to err on the side of caution. Without further ado, here are a few examples of what I call faux thai. In my opinion, the fact Thai people eat beef and rice does not make a recipe that includes those ingredients Thai. Presumably including the word “Thai” in a recipe is good marketing for them. What is discouraging is that people will make and eat these dishes and think that they like “Thai” food. They will end up being like the guy who went on one of Kasma’s trips in the early years; he complained that the food in Thailand was not what he ate at restaurants in Berkeley. I’ll provide just one more example, one that a friend recently sent to me. It is Thai-Style Pork Stew. In addition to the ubiquitous peanut butter (creamy! ), there’s pork, red bell pepper, teriyaki sauce, vinegar, crushed red pepper, cloves, basmati rice, green onions, peanuts and lime wedges. Just one thought here: Thailand has one of the tastiest rices in the world in jasmine rice; basmati rice comes from, well, India. Sigh. Here’s another good post on this topic: The green curry paste that got me seeing red! at the blog Chez Pim. Written by Michael Babcock, November 2009. This is a picture of some luscious dried red chillies at the morning market in Sukhothai. 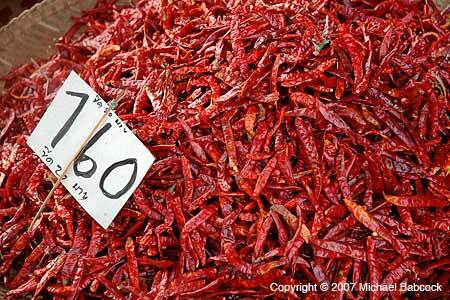 For years Kasma has struggled to find really good dried red chillies in Bay Area markets; she’s been unsuccessful. So now, every year when she goes to Thailand, she buys several kilograms at the Sukhothai market and brings them home to use during the year. The vendor tells her that these come from India but does not know the variety or the name. She’s found that using these in her cooking makes a marked difference. It’s particularly useful in recipes such as Roasted Chilli Paste (Nahm Prik Pow) but noticeable in any recipe she’s tried. Numerous new varieties of colorful winter squashes are now available in the fall, but I still favor the Japanese kabocha (which means “little pumpkin”) for my cooking. It has a sweet and nutty flavor, smooth and creamy texture, low water content that does not dilute flavorings in my dishes and none of the stringiness characteristic of many kinds of western pumpkins. Because of these attributes, many of my cooking students have found it to be exquisite for making pumpkin pies for Thanksgiving. With kabocha, I don’t have to wait until fall to make my favorite pumpkin dishes. It is available most of the year round, from all kinds of markets, including many chain supermarkets. This is because it is a dry squash that grows easily and stores extremely well, sometimes for up to six months in a cool, well-ventilated room. Smaller, flatter and more disc-shaped than the common pumpkin carved at Halloween, kabocha squashes average 2-5 pounds in size. They are eaten by Asians at various stages of maturity. Less-mature, deep green ones with light yellow flesh are cooked as vegetables in stir-fried dishes, curries and vegetable soups. (See Kasma’s recipe for Golden Pumpkin Coconut Soup.) As they ripen, the forest-green peel turns a paler grayish green, tinged with splotches of yellow and gold. 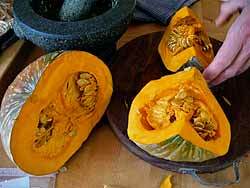 Inside, the flesh becomes a brilliant shade of orange-gold, much more concentrated with flavor and natural sweetness. 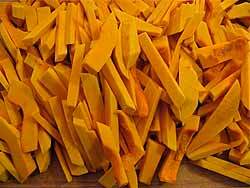 At this stage, these golden squashes make a perfect base for all kinds of irresistible and colorful desserts. 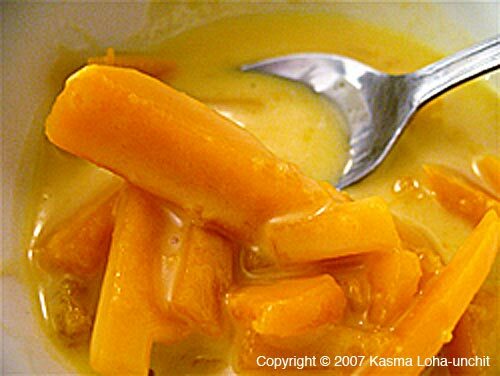 I am particularly fond of two sweet treats my mother frequently made while I was growing up in Southeast Asia. 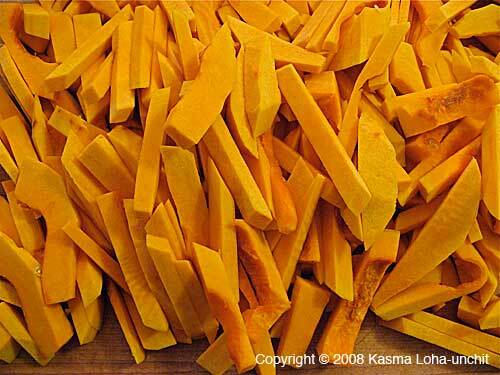 One recipe (Sweet Soup of Kabocha in Coconut Milk) is given below and the other Sangkaya is found on our recipe page. They are easy to make and delicious, combining the goodness of the “little pumpkins” with the rich flavors of coconut milk. Whenever I come across a beautiful ripe kabocha at the market, I couldn’t resist taking it home to turn into these tasty treats for friends and cooking students. They are delightful in cleaning the palate following a spicy meal. 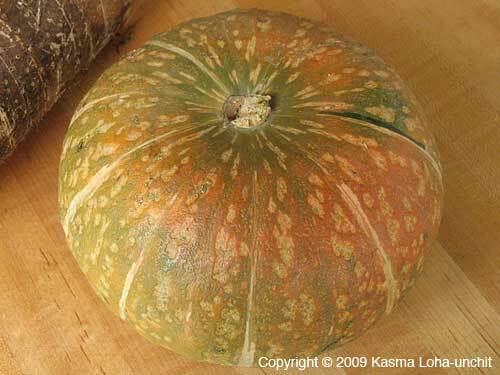 Select a fully-ripened kabocha with good weight for its size – one splashed with golden hues on a grayish green exterior. But if you are not able to find a ripe one, substitute with any ripe golden winter squash, such as the tasty sweet dumpling, delicalata, kalabasa or buttercup. See our website for more //www.thai recipes and more //www.thai ingredients. You might also enjoy our post on //www.thai (Sweet) Snacks – Kanom Wahn. This recipe is also available on our website as Sweet Soup of Kabocha in Coconut Milk. Cut the kabocha squash in half, scoop out the seeds and peel off the greenish skin. Cut into strips about 2 inches long, 1/2 inch wide and 1/4 inch thick. Another (sweet) recipe with coconut milk is Tapioca Black Bean Pudding. 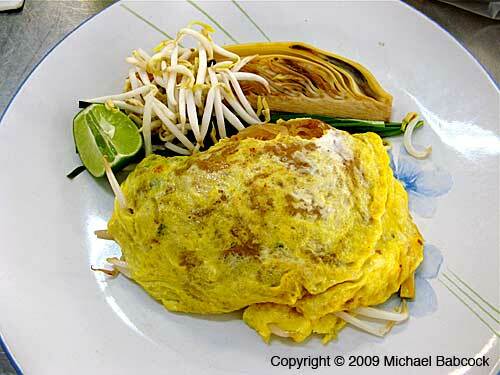 You are currently browsing the Thai Food and Travel Blog blog archives for November, 2009.